Before I get started on my first t thoughts of Melbourne I thought I’d share a little bit about the flying experience. When I arrived on Friday it felt like I’d been awake for three days and staying up long enough to reset my sleeping pattern seemed like an impossible challenge. The Cathay Pacific experience was all in all a pretty good one. I actually had enough room to be confident in making the claim that I was comfortable on the flight. I did manage to doze off for a couple of hours on two occasions but spent most of my time catching up on the cinema of 2013. There was an added bonus that my bag was at the airport when I arrived and customs was a breeze. It wasn’t all plain sailing however, when I arrived at Nomads they had no record of my booking. Fantastic. Turns out, neither did I. So I made a new one there and then and eventually got to lie down. Day one was spent in a bit of a haze, having arrived at 8am and being unable to check in until 2pm I had plenty of time to kill. First stop was to wander around the Queen Victoria Market, which at that time had hardly begun. More on this soon! I then took a coffee break with a city map and tried to decide exactly how far I thought I could walk before I just gave up and lay down on the pavement. In the end I walked across the city centre to the Yurra River where I came to the solid conclusion that it was time to take a break. 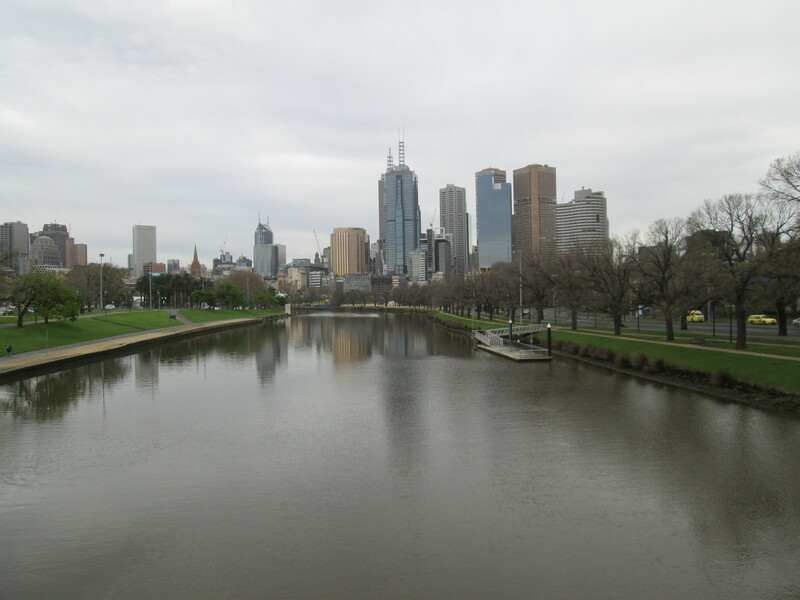 Melbourne looks like a pretty interesting city. In many ways, it’s like a combinations of every city I’ve ever been to previously. Looking across the skyline I was immediately drawn to compare it to Rotterdam. It is as if the city council have turned a blind eye to architecture and style and let a nightmare of styles clash together. In all fairness, I actually think it’s kind of cool. What is in these buildings then? The predicted array of coffee shops, bars, restaurants and boutiques are everywhere. Hardly a mainstream name in sight. I was thinking of Portland, Montreal, and Antwerp. On a related note, Nandos are here and they’re not pretending to be a classy joint. It’s got fast good plastered all over the nasty little tables. Returning to Rotterdam, and maybe drawing a bit on Chicago; there is modern art littering almost every street corner. Some of it good, some of it interesting, some of it neither of the above. Safe to say I think I’m going to enjoy my time here! Add this to the list of things we know. 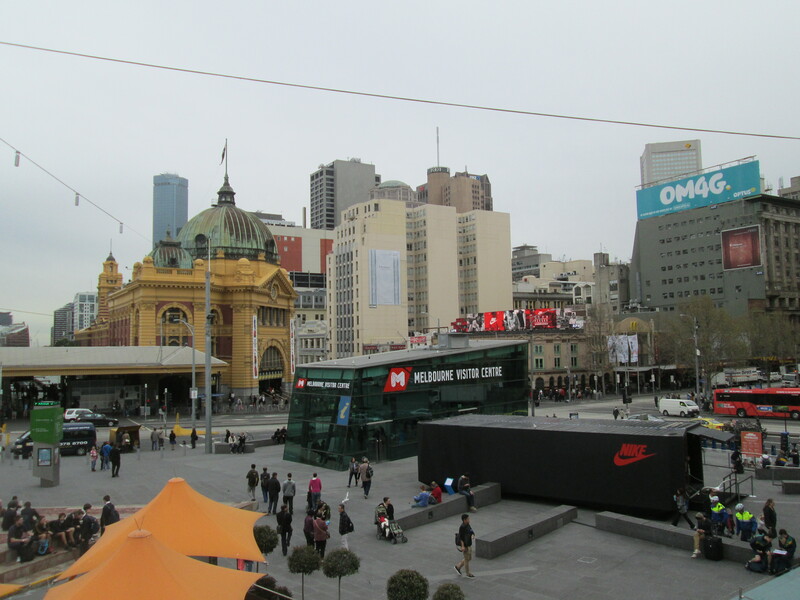 I stayed in Nomads when I was in Melbourne – one of the best hostels I’ve been to. Was only suppose to be there for 2 days ended up being a month. Have sick time!! Thanks! It definitely is a good one. Been here five days so far, reckon I’ll be here for longer!